John Tilson has great things to say about the 2012 wines, with a sneak peak of the 2013 Chardonnay! Click here to visit the website. I first tasted wines here beginning with the 2009 vintage and have followed each vintage since (to read the first article click here). 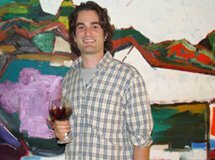 In a very short time Owner/winemaker Gavin Chanin has established a reputation for making some of the most beautiful and distinctive wines in the state. Each bottle is literally a work of art featuring one of Gavin’s paintings. Inside the bottle are wines of great distinction and finesse. These are wines to buy! Below are notes on some terrific wines from 2012 now in bottle and a note on a lovely 2013 Chardonnay still in barrel. Reflecting the growing season, the 2012 Chardonnays show beautiful fruit and richness with alcohol levels generally higher than other recent vintages. They have a lot of early appeal. Los Alamos – There were 275 cases of this wine produced. It is a rich, full wine with a light yellow color and a deep floral perfume with citrus notes. Rounded and lush with lots of fruit and subtle floral and citrus nuances there is also an underlying structure that maintains the sense of balance – Outstanding. Bien Nacido – Production here was 425 cases. More restrained than the Los Alamos bottling, this Chardonnay is classic. Light yellow in color with a lovely floral perfume with just a touch of spice and citrus, it is supple and rounded with a bright citrus spice undertone showing a nice crispness – Outstanding. Sanford and Benedict – Only 175 cases of this wine were produced. More in the style of the Los Alamos, this Chardonnay has a gorgeous floral perfume and is lush and supple with faint tropical nuances. Very flavorful, this is really lovely – Outstanding. The 2 Pinot Noirs tasted both have elegance and finesse along with wonderful fruit. They exhibit great charm and are very stylistic. Los Alamos – There were 325 cases of this wine produced. With a very nice color, there is a lovely floral tinged berry perfume that is followed by lots of very pure fruit on the palate. Subtle hints of spice provide a nice complexity and the wine is balanced with a lot of finesse and is very easy to drink – Highly Recommended. La Rinconada – The production here was 175 cases. With a deep color, the wine exhibits a gorgeous cherry, berry perfume with floral spice nuances and has a stunning amount of fruit on the palate. Subtle hints of floral spice add to the complexity. All in all this is a gorgeous Pinot Noir with finesse, style, and complexity – Outstanding. Los Alamos – Whereas the 2012 version of this wine is richer, this wine promises structure and a lot of finesse and crispness. Light yellow in color, the wine has a lovely floral perfume with hints of tropical fruit and citrus. Supple and rounded with very pure fruit there is a bright underlying crispness that gives the wine definition – Outstanding Potential.